Matthew Scully is an unusual proponent of animal rights, coming from the Christian-favoured, Republican party of the U.S. and speaks about people automatically assuming he is on the side of hunters and pig 'farmers' when, in fact, he has been a vegetarian for over 30 years. While he does support animal rights, he still makes that stand from a generally religious perspective, arguing that current treatment of animals is an abuse of god-given dominion, and disagreeing with the secular reasoning of animal rights proponents such as Peter Singer. Scully's ability is shown when coming to the main thrust of his book, where he writes about animals, how they are treated and how they should be treated. He is an excellent writer (a speechwriter for former president George W. Bush), and a dutiful investigator, travelling to most of the places about which he writes. These places are a trip to some of the darkest places in our moral landscape, beginning at Safari Club International, an organisation of hunters given tax-free status, through an international whaling convention in Australia, and back to the USA. He travels inside the horrific world of intensive pig farming, where pigs may never feel mud or straw, be permanently immobile in a cage, go untreated for tumours or broken limbs as long as they are fertile, and where some are killed by immersion in boiling water – still fully conscious. When Scully speaks of religious reasons to protect animals, he loses a lot of his flair. This also happens in his later attempt to ground animal rights in the antiquated idea of natural law, avoiding secular philosophy. It is perhaps his lowest point, as it amounts to little more than the fallacious appeal to tradition, and it comes near the end of the book, after his early foray in theology has been thankfully forgotten. Thus, amazingly, even though animals may experience pain, they are not aware of being in pain. God in His mercy has apparently spared animals the awareness of pain. This is a tremendous comfort to us pet owners. For even though your dog or cat may be in pain, it really isn't aware of it and so doesn't suffer as you would if you were in pain. Along the way, Scully has some more-intellectual asides. At one point he touches on animal consciousness, and points out the myriad flaws in the reasoning of those who claim there is none. He spends a fair amount of time criticising Peter Singer (who ironically gives the book a good review), mainly from the position that Singer's controversial views on other topics – infanticide and euthanasia for example – turn off the majority of people from animal rights. However he never commits to religious reasons either, and seems to wobble back and forth without coming to solid conclusions, wanting to reduce animal suffering but unwilling to draw a line beyond which things become impermissible. Despite his lack of a serious ethical foundation, Scully is more than capable of getting his message across, even if he often resorts to emotional appeals. The questions he asks – such as whether you believe the ease or taste of meat outweighs the suffering of the animals that provide it; whether you are willing to treat animals as mere commodities to be bought and sold; and why you would eat a pig, a cow or a chicken, but not a cat, a dog or a whale – should be seriously considered by anyone who has anything to do with animals. It's also worth recalling that people can agree on the same objectives for different reasons: A secular philosopher like Peter Singer can oppose factory farming because it's unethical by his theories of justice. An environmentalist can oppose factory farming because it's reckless stewardship. A conservative can oppose factory farming because it is destructive to small farmers and to the decent ethic of husbandry those farmers live by. A religious person can oppose factory farming because it is degrading to both man and animal — an offense to God. The point is to end the cruelty. And we shouldn't let secondary differences interfere with primary obligations. While I do disagree with a number of minor points, I find myself horrified by his findings and fully supportive of his conclusions. Indeed, after reading Dominion, I was forced to become a vegetarian in order to maintain any semblance of philosophical consistency. If you're interested in philosophical consistency you should go vegan. The suffering of animals providing dairy and eggs is worse than the suffering of animals providing meat. How so? As long as it's not battery egg farming I'm not aware of any problems associated with either of those activities. Chickens lay the eggs anyway, mostly unfertilized. The best way to attack this kind of a problem is information, unfortunately factory farms do their damned best to make sure no one knows where their meat product goes. One doesn't necessarily have to go vegan to combat these kind of farms, if they're willing to pay the price for stuff made outside factory farms... and that is when you can find out which products come from those kind of farms. Humans usually don't think about the products they buy too much in general, they tend to grab the first thing on the shelf. I don't buy eggs not because I'm a vegan, I just have no culunary skill, and if I did have to buy any my parents would have some for sale. I'd probably average a half gallon of milk on a biweekly basis. Once again, because I don't use it all that often. Sadly with the government involvement in the farming industry I don't know if it's even possible to figure out exactly where your product came from, because in the end, as far as milk goes, they seem to all just come from the same place to the layman. Heck, there are some people in the city who believe that farming is something that doesn't exist in "modern society" no less then the product could come from different farms. I think Scully's words are wise. Instead of people trying to tout their methods as the only or best methods of combating this and alienating others who may not chose veganism, or lack thereof. Perhaps it'd be for the best to learn of all the possible ways to combat factory farming that would work for those of many different lifestyles and tastes and perhaps we'd be able to overcome this issue. Well the problem isn't just factory farming. Scully aims his complaints at factory farms and he does say that he's fine with eating meat farmed in the traditional methods because there farmers still respected and cared for the animals. But, and this is why he seems so torn, he makes the case that animals can suffer and therefore are of moral significance, nothing major there, and that animals are killed or suffer in meat production, also obvious, so consuming meat is generally a negative action. He also goes along with saying that meat isn't necessary any more so you're inflicting unnecessary suffering by consuming meat. If we had to eat meat then we could say it's a necessary evil but as there is no need for it we can't justify the suffering. And that's why I find his refusal to advocate vegetarianism confusing, unless it's just to appeal to a broader audience by not proposing anything too drastic. We call lions & tigers ferocious and savage when they kill, but killing for them is their only means of survival. For us, killing is completely unneccessary in fact meat eating has been proven to be a more unhealthy diet than vegan diet. Killing animals is done for entertainment and to pleasure our taste buds. So, who is the savage one? If I ever met an alien I'd cry for mercy; I'm truly ashamed of the human race. I'd love to meet Matthew Scully. What an interesting man and a beautiful writer. He wrote Dominion and then wrote a speech for, of all people, Sarah Palin! I'm reminded of Leonardo da Vinci, also a vegetarian and if he were alive today would be considered an animal rights activist. He wss a pacifist who designed horrific war machines. in fact meat eating has been proven to be a more unhealthy diet than vegan diet. No, a health conscious meat eating diet is not less healthy then a health conscious vegan diet. Likewise, either can be quite unhealthy without forethought and care. This is easily missed by many studies which assume all meat based diets are the same, when instead vegans in Western countries are more likely to have spent some time thinking about their diet whereas only a smaller subset of meat eating people have done so. Issues like animal welfare are already enough of a mess, and trying to turn a moral issue into a health issue with misinformation can make things a lot worse. I'm betting a lot of vegans are more healthy than people not on a special diet, though. They are consciously thinking about what they eat already. I mean, if you're going to cut out certain foods for one reason, it's probably easier to cut out other foods for another. 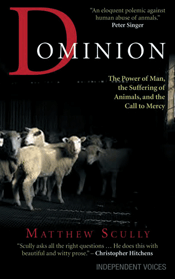 I just realised although both cover versions of Dominion show sheep I can't recall them even being mentioned in the book. I wonder if that is meant as further religious symbology or just because pigs, the main farm animal focus, aren't the most popular of animals. Article answers that already "and why you would eat a pig, a cow or a chicken, but not a cat, a dog or a whale – should be seriously considered by anyone who has anything to do with animals." Pigs don't sell books apparently. But at least they sell bacon. I'd probably eat a whale no problem if they weren't, you know, endangered. I don't think I'd have too much problem with dog (though not a wolf). I'd have a problem with cats. Too tough, I'd bet. Pigs are basically scavengers; some people have hypothesized that pigs were "unclean" in the Bible because a desert tribe into burying the dead rather than burning them would have trouble efficiently burying their dead in a rocky, sandy terrain in a way pigs couldn't get to them. But, as Pig pointed out in "Pearls Before Swine," BLTs just taste so darn good! "Meat = Animal Cruelty" - at least Google AdSense is totally on the ball here with its ad selection.